Professional athletes, surgeons, first responders-all perform remarkable feats in the face of intense stress. Why do they thrive under pressure, while others succumb? What separates the two is attitude. Resilient people meet adversity head-on and bounce back from setbacks. 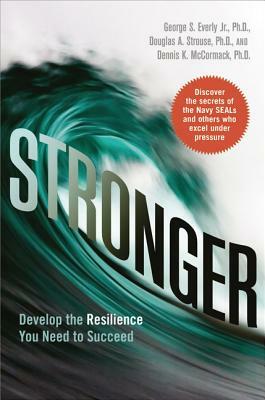 They seem to naturally exude an inner strength-but studies show that resilience is something that anyone can build. Analyzing the heroic exploits of U.S. Navy SEALs and others who succeed against all odds, Stronger identifies five factors that combine to unlock deep reserves of personal power: Active optimism-believe that you can change things for the better * Decisive action-you can't succeed if you don't take the leap * Moral compass-face any challenge with clear guiding principles * Relentless tenacity-try, try again * Interpersonal support-gain strength from those around you Drawing on the unique perspective of a standout team of authors (a stress management expert, a skilled entrepreneur, and a Navy SEAL), Stronger explores the science behind resilience and explains how you can develop this vital trait for yourself. Whatever your profession, today's demanding world calls for a special kind of strength. This revealing book holds the key. GEORGE S. EVERLY JR., PH.D., is Associate Professor of Psychiatry and Behavioral Sciences at Johns Hopkins University School of Medicine and Professor of Psychology at Loyola University Maryland. One of the fathers of modern stress management, he has consulted with FEMA, ATF, and the FBI National Academy. DOUGLAS A. STROUSE, PH.D., is founder and CEO of Global Data Source. He has a doctorate in organizational psychology and is a recognized expert on business resilience. DENNIS K. MCCORMACK, PH.D., is one of the original Navy SEALs. He pioneered SEAL combat doctrine and tactics in Vietnam, and holds doctoral degrees in leadership and human behavior, and professional psychology.